How did they come to this conclusion? By studying similar conditions on rocks found in the Mojave Desert. Because the arid conditions are similar to the Martian environment, investigators can assume carbonates are hiding behind a veneer of rust – keeping them from view. This new evidence came to light earlier this year when Bishop and Chris McKay – a planetary scientist at Ames – collected samples from an area called Little Red Hill. Why are these carbonate findings important? Every mineral has a unique absorption bands, spectral frequencies and vibrational modes. Using this information, planetary scientists can identify composition. Because of the layer of rust, many carbonate deposits may have been overlooked because their spectral signatures were masked. “To better determine the extent of carbonate deposits on Mars, and by inference the ancient abundance of liquid water, we need to investigate the spectral properties of carbonates mixed with other minerals,” Bishop said. 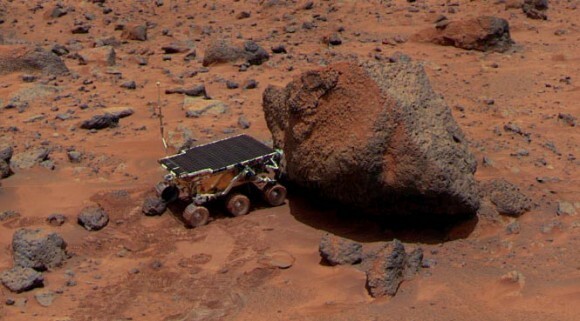 Like all rust, the deposits were so overwhelming that NASA’s Mars Exploration Rovers, Spirit and Opportunity, used a motorized grinding tool to “clean” samples before spectral examination. With NASA’s newest and most capable rover, the Mars Science Laboratory “Curiosity” mission nearing its launch date, we may be able to take another, closer look at possible life on Mars.